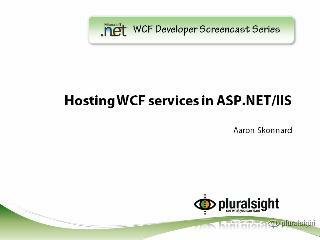 Welcome to the latest video in the weekly WF/WCF Screencast series. In this short video, CSD MVP Aaron Skonnard from PluralSight guides the viewer through how to configure your WCF Service with endpoints. This screencast uses the service you created last week to -a- introduce you to WCF adapters, bindings, and contracts, and -b- shows you how to use the WCF Service Configuration Editor to modify these endpoints and add new endpoints. For additional information on WCF, please check out the WCF Dev Center on MSDN and the .NET Endpoint team blog. For more information on classes offered by Aaron and the PluralSight folks, check out their catalog of instructor led courses and new online courses that cover a variety of Microsoft technologies, ranging from .NET v3.5 to WSS to BizTalk server. I did this screencast and am getting a weird error when I try to run this. System.InvalidOperationException: Cannot load the X.509 certificate identity specified in the configuration. Don't know what the deal is. Any help to this noob would be greatly appreciated. I think I've actually seen this before (I'm more a WF person than WCF) - check your binding; it sounds like you're using WsHttp, which will try to layer on WS-Security. Try changing that to a non-WS setting, or check the other binding options to see if it's specifying the use of a x509 cert in it somewhere. But in this screencast, Aaron has in fact these settings in the app.config, so still not sure how his example works. I have found something similar. Seems each time I create a named pipes endpoint, I get the above <certificateRefernce> elements auto included in the app.config. Deleting seems to address the issue. It's the endpoint wizard. If you create the endpoints manually, the certificate references are not created. I am new to WCF... I am getting the same error in my service... Tried deleting the endpoints configured thru the wizard, didnot work. Any Ideas how to make it work? I got the same problem. Just comment this identity node and it will start working again. When i try to create named pipe endpoint, i'm getting the following error: "Invalid URI: The hostname could not be parsed.". When i'm writing net.tcp instead of net.pipe, there is no error. Thanks for posting this video. It's quite instructive and informative. Could you post more advanced videos about WCF ? Because even they are good, people may need advanced ones to create advanced applications. i am new one on WCF. it says that it is invalid addresss. now what i have to write here? as it says, that this address is invalid. the same address in my host address place. which i have wrote above. now what i have to do?? please let me know thanks. The tool worked wonderfully. Thanks paul. I had the same problem. Please read this blog for the solution and the tool. hi there is no download link for this video. just add <dns value="localhost" /> in identity. ***Note: This help is only based on this tutorial. "Please Test before deploying." Apologies, my above post is completley useless because all the code was stripped out...Vipin nailed it above...adding the tag into is the fix. Why does the speaker use 'localhost' in his TCP and named pipe endpoints? Is this a requirement, or could they just as easily drop that part of the name (especially if the service is only running on the local computer)? "TCP and named pipes are really only good when you have WCF on both ends." I ran into the "System.InvalidOperationException: Cannot load the X.509 certificate identity specified in the configuration." error as well. At that point I added the <dns value="localhost"/> to any identity section that was missing it. "Please try changing the HTTP port to 8732 or running as Administrator. System.ServiceModel.AddressAccessDeniedException: HTTP could not register URL http://+:8080/evalservice/. Your process does not have access rights to this namespace"
I tried changing the port. Running as administrator fixed the issue, but I did not like that solution. There was a link in the message that I followed. "https://msdn.microsoft.com/en-us/library/ms733768.aspx"
I ran the netsh program and ran this command to fix my problem. http add urlacl url=http://+:8080/evalservice/ user=DOMAIN\username. NOTE: to delete the urlacl, netsh, will need to be ran as administrator.